1. When we took our canoe trip a couple of weekends ago, and docked briefly at a little island, I discovered a perfect little mossy heart on the trail. 2. When I was 7 (1982) I used my allowance to buy a gypsy fortune teller doll. She had a tiny magic 8 ball. You couldn't see her too well in the box, so when we got her home and opened the box to discover a very much unclothed and anatomically correct well-endowed upper half, my mom and I were shocked. And we had to laugh. And then my mom designed a shirt for her so she could be covered up and decent. Why they would have designed a shirtless toy like that is beyond me - wonder how many of them sold? 3. If we have some free time, I take the boys to the library. They are signed up for the reading program, and have to read 600 minutes this summer to get the prizes. So we check out a lot of books. I love the library - they have comfy couches I can sit on and free fast wifi, and the boys are happy to play with their puzzles and train table. 4. Never assume someone is a bad parent when a child is acting out. Recently we put Cort on a new preventative for his asthma (he continues to struggle with this), and the steroids in it made him mean. And I do mean MEAN. It finally got to the point where we were in a parking lot trying to run an errand and he was screaming at me at the top of his lungs and hitting the sidewalk with his fists and I thought, "This is NOT my child". That was my breaking point. I took him off the medication, and explained to his doctor why. He'll be going for a breathing test later this summer. 5. I like it really cold at night when I sleep. In the winter I don't even turn on the heat in our bedroom. This post linked with Nancy for Random Friday at A Rural Journal and Clytie at Random Hearts. Love the heart! That's a great photo. Sorry to hear about Cort's asthma...my mom and several of my nephews/nieces struggle with asthma. So many times, meds cause such bad side effects. Hope you all enjoy the weekend. Cool find. Some of those meds do have bad side effects. Hope his asthma improves. how does your hubby feel about the heat in the winter. I know I enjoy cold when I sleep but the hubby does not always agree. I have never like those fortune tellers - they are kind of creepy. It is scary how meds can effect us. I think you were so wise to take him off them. We had to use a similar drug for awhile. Oh that is scary about Cort I hope they figure something out for him. All of my girls loved Summer Reading Program at the library. Sorry to hear Cort had a hard time with his meds. I hope they find something that works. My husband reacts to some allergy meds like that, no fun! I'm so glad you took Cort off of those steroids. My oldest son was on them for awhile when he was young and I swear it changed his metabolism for life. Nasty stuff! I had to giggle at your story about the gypsy doll - I never heard of them! My daughter also has asthma and we had similar issues with one of the more famous corticosteroids - I can totally sympathize. But the perfect heart is what made me gasp - I especially love the "starburst" effect on the right side - how absolutely amazing! Good for you for taking him off the steroids! I love it cold when I'm sleeping too....maybe we have bear blood in us! I can relate to not judging a child by it's behavior. Usually you can tell if a child is in distress or if a parent has been remiss in managing the situation. I have a grandson with autism. He's 20 years old now and he often acts up in public. People stare. How rude! He can not help it. My heart breaks for him to be 'normal' and act naughty just for meanness sake. I am SO Glad you realized what brought on the "MEAN ATTACK." Imagine how terrible he must have felt . . Good On You!!! That mossy heart is a wonder. Thanks for sharing. I'm sorry your little one was having trouble w/the meds. It's great that you recognized it though. I agree w/you. I have four of my own (kids) and I know there are moments that happen that have nothing to do w/parenting. I don't judge (usually, and then I kick myself if I do mess up and jump to a conclusion...that helps, ;)). Love that you take the boys to the library. Unfortunately here, they're cutting employees, hours and even closing a couple. Sad. Steroids, as much as they can help, not everyone can take them. My daughter was on them (in her 30's and early 40's) had to take them due to the colon removal; wicked! i KNEW clytie would love that heart! wow, it is perfect! laughed at the gypsy doll! OMG! poor cort! Poor little guy, he must feel much better, hope the summer is as asthma-less as it can be for Cort. Love the mossy heart...the library was a favourite place for me as a child, first at school then the public one, lucky boys. I love finding hearts in nature. The last time we were in Hawaii Amy found a heart cut out in some rocks! So cool-just like your moss heart! I sleep better in a very cold bedroom too. I can't stand to be too hot any time, especially at night. LOVE the moss heart! I have a thing for finding hearts in nature.. just makes my day! I'm the same about cool sleeping.. I like a cool room with warm thick covers. They say it's healthier for your heart to be warm in blankets and breathing the colder air, than a hot room. Might have been a Scandinavian or Finnish thing I heard. The heart is awesome, it looks like you made it yourself! I know how the steroids make you crazy and antsy and hungry and mad! Is his asthma getting worse? Gosh. I guess you already have a specialist. Is he a pulmonary doctor or what? I am glad you took him off the drug, and hope he will be well until the tests. My mom had asthma as a child, she had to drop out of school forever at third grade. Back then the doctors did not know much about asthma and to this day I remember the very sweet medicinal smell of her asthma spray, you had to pour the med into a glass vial and squeeze a bulb to get the mist. Please let us know about the tests. We enjoy a cool bedroom for sleeping as well. Even have a fan going for the pups on the floor. It's a freezer chest, but we all sleep sounder when cool. I had no idea that steroids could do that. WOW. Laughed so hard at the naked lady. That is so odd! And yes, I hate when people judge people's parenting (unless it's cruel or aggressive). I've had my struggles with my kids, believe me and people that have given me "the Look." I try not to do it to others! 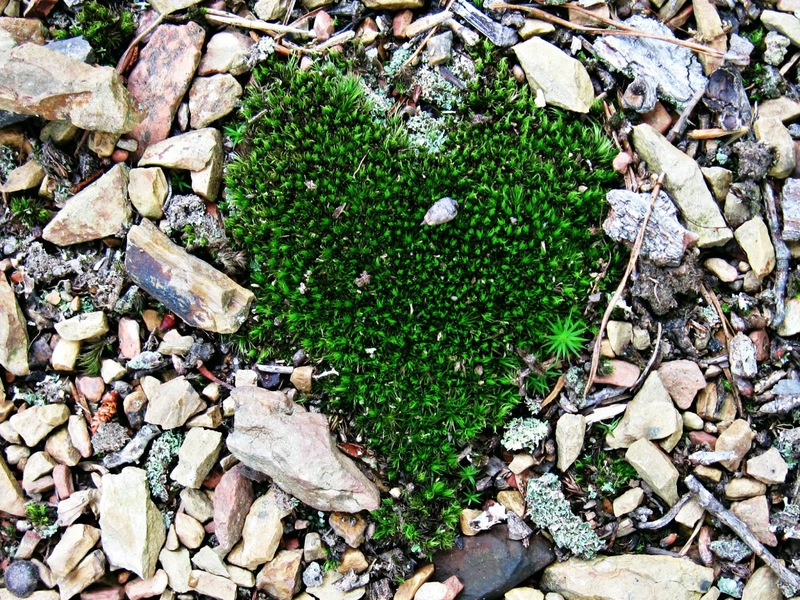 What a cool moss heart! I'm sorry Cort has asthma. I can understand you taking him off that medication. When I'm on prednisone, it messes with my moods really badly. I get irritable and depressed. Has the doctor mentioned Singulair by chance? It's a nonsteroid and is used as a preventive. I've taken it, and, most importantly, my nephew took it when he was younger. Hi Lisa, oh dear, your poor little boy. I can tell you that I've been thru it with a hyperactive, asthmatic son who was supposed to be on Ritalin, but being the Dr's daughter I absolutely refused and treated Jon with diet and naturopathic remedies and guess what! He's 33, and a healthy, well adjusted, terrific young man and he's outgrown the asthma and channelled his hyperness into Judo, snowboarding etc. So take heart that everything will work out as your son grows. (It's just painful for mom right now, isn't it?) Hugs. Hope you have a terrific weekend and it's been nice catching up with you again. That heart is amazing! What a find! And you made me long for the days when my kids were little and we went to the library all the time. I'm curious what medication your son was on for his asthma. When my oldest was five, the doctor prescribed Slo-bid, and it turned him into a different kid. He was mean, too, and I took him off and told the doctor why. Prednisone would make my kids a little hyper and sensitive, but I never saw that kind of reaction again, like I did with Slo-bid. I hope yours get better with their asthma. My oldest now runs marathons! Cool is best for me, too. Hope your son can find a better way to control his asthma - it must be hard on him. I've always loved libraries since I was a kid myself. I like it cold also when I sleep also..but I live in new england and my pipes would freeze if i didn't turn on the heat. That mossy heart is so cute! What a nice thing to stumble upon. I hope you can find something to help with his asthma. I know the struggle all to well. That mossy heart is so perfect! I do the same I can not sleep in a heated room. It actually makes my asthma worse in a heated room. My poor husband sleep with two quilts in the winter just to stay warm. I hope you have a great weekend. Hope they find some relief for Corts asthma that doesn't alter his personality in a poor way.It is true with so many drugs , sometimes the side effects are worse than the actual problem in the long run. Very cool moss find. I sleep with window up slightly all winter ...really dislike these hot nights. I like libraries, though I haven't been in one in quite a while.. now it's more kindle, internet..
Love the heart....that is so cool! My kids grew up going to the library and always participated in the summer reading program. Now both my boys are volunteering their time at the library and in the teen book club! Yeah, steroids do strange things to people. My youngest gets the same way when he has to be on them for throat infections. I hope they find Cort a new med that will work without negative side effects. Love your heart find.I am Golden Heart Productions so often make a few when out and always enjoy finding them. Hi Lisa, that's an amazing find -- the moss shaped like a heart! Nature truly is a wonderful artist! The heart shaped moss was a special find. Thanks for sharing it! That's great you take the boys to the library and they have the summer reading program. Good thing you got Cort off steroids. Sure hope his asthma improves as he grows. Great post Lisa. Raising 5 girls, we were ALWAYS finding things that look like hearts. Thanks for posting about kids acting out. I hope it helps many other parents. It's a dangerous thing to have someone assess you as a parent when they see your child acting out. We had someone call the police on us years ago for something she THOUGHT was going on. It's not funny. It's not thoughtful. It's none of your business. Serious consequences can happen when some fool thinks they can fully assess your family with one event. Beautiful... mother nature is giving us a message of love for all.. Such a cool heart find! #4 I had asthma when I was little. I outgrew it mostly. During that time I would get attacks in the middle of the night and not wake up. My sister woke my parents up with the wake up call, "Mom, Dad Alissa's not breathing!" Off to the ER we went. Well my asthma didn't come back strong until I went to Savannah, GA for grad school. It was rainy and humid. A great spot for mold. The pollen was so thick you could see a yellow coat on people's cars. This summer has been bad! I had a major attack when we were camping. It was horrible! It started to rain and smoke from everyone's fires went into the cabins. I was wheezing, coughing from asthma, sneezing and snotting from allergies. I was worried I'd have to go to the ER because I took all my meds, and was not getting better. I did get better. One night here I did this in my sleep and didn't remember a thing. It's really scary. I have noticed the little humidifiers help get air and moister into the lungs and break up the smoker sounding cough. My mom thinks I should start a no sugar, no glutten diet. Compared to the rest of the population I am low on those things, but it's not all the way out of my diet. The UK has done studies on rain and how it effects asthma and allergies. In the US I haven't found anything. The UK studies have said that when it rains it releases all sort of allergens into the air. I could see pollutants from the sky being pushed down as well. I can see how his meds made him a different kid. I hope they find some meds to help Cort! Steroids make me really tired. Allergies themselves give me migraines and I feel more bitchy than usual. The good thing is that many kids grow out of asthma. I hope Cort does. I wish Cort all the best in feeling better soon, Lisa!